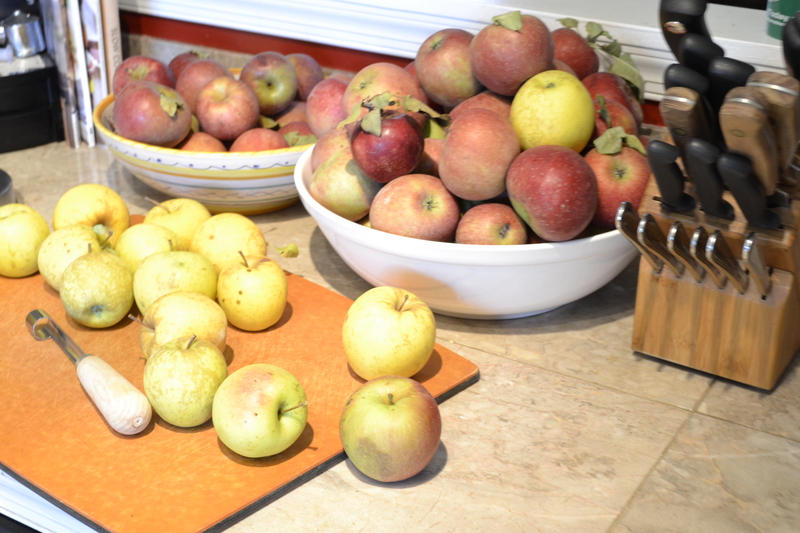 We went apple picking over Columbus day weekend, and have made loads of apple related things in this little kitchen. 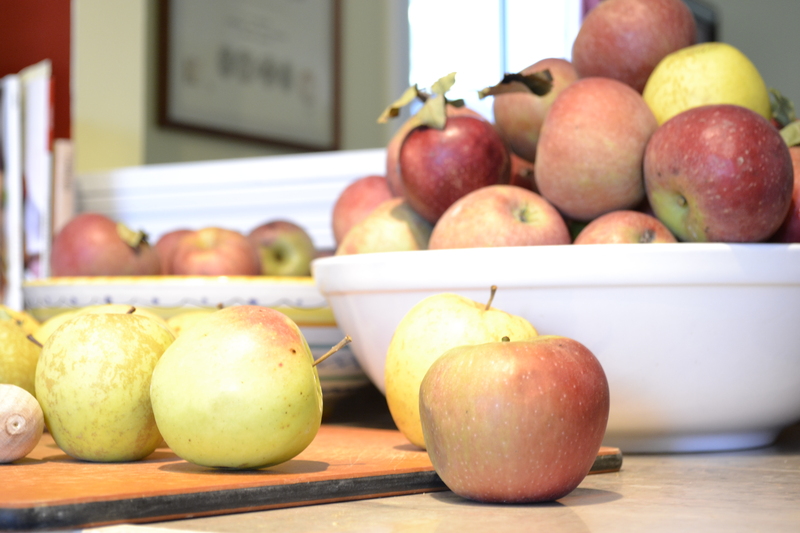 Apple pie, apple sauce, apple butter… Lots of apples were sliced and eaten with cheese slices as our idea of the perfect lunch. As an aside, my mom gave me an apple corer ages ago – I didn’t appreciate its usefulness until I had a bushel of apples to process, so thanks Mom! Apple pie. I made a few. The conventional ones are in my freezer and will come in handy when I need dessert in a hurry. Then there is the one pictured above. Oh my. It had me at “a stick of butter” and it was every bit as decadent and wonderful as you’d imagine. Durango Mom is a genius for this one. 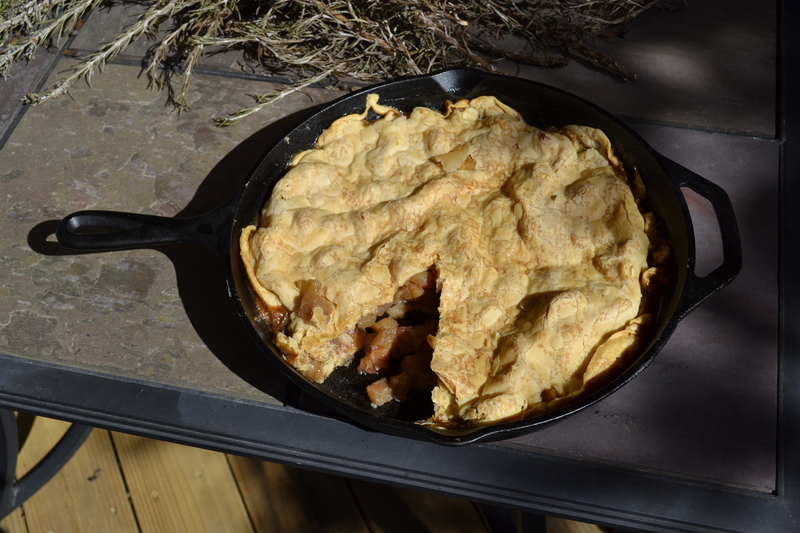 You should make it – get some apples, run, now, and make this pie. Apple sauce. I don’t have a recipe to share. All the recipes seemed to contain so much sugar, and I didn’t see the point. My instructions are this: core, peel and slice apples. Put in favorite pot, add water (not quite enough to cover.) Add sugar and cinnamon if you want (I didn’t want.) Cook for a very long time until at desired softness. You can process or not process, depending on whether you like chunks. My son will eat this by the bucket. And luckily I have buckets of it in the freezer. Apple butter. Delicious and wonderful stuff. I made my own in the slow cooker using a Cooking Light recipe. It was not as effortless as using a slow cooker would imply. 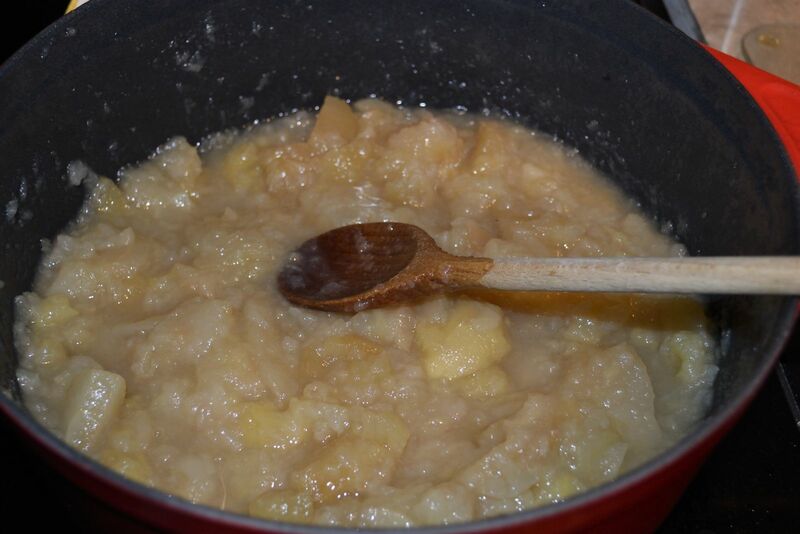 Pushing the stuff through a sieve was a serious hassle, but don’t skip it because any apple skin that may inadvertently have landed in the pot will turn into shards of glass during the cooking process. (Don’t ask me how I know this.) 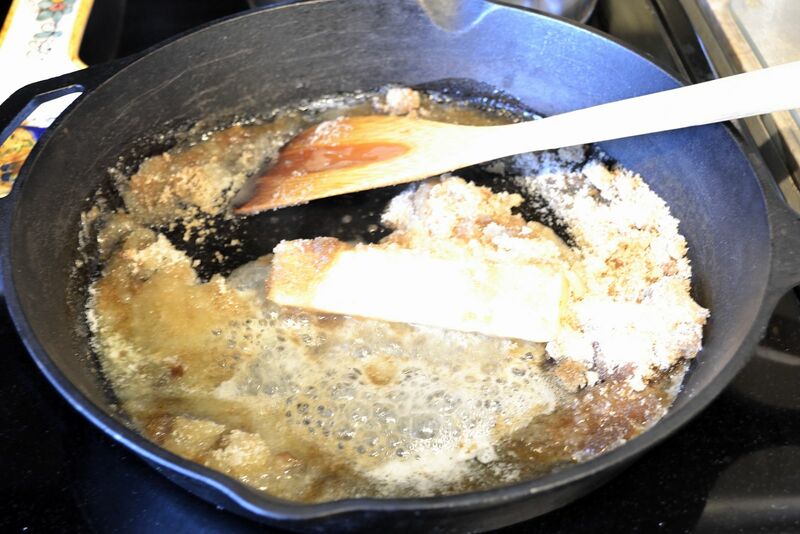 I also have to say that despite a much longer cooking period, it was never as thick as other apple butter I’ve eaten. Still good – especially over cheesecake. In all the fuss there were no pictures – sorry. These apple bars are delicious (and freezes well in individual pieces.) A few notes – if a recipe calls for a 9 inch pan, you should probably measure your pan in case it is actually 10 inches. Ahem. Also, just because you discovered a stick of butter in the back of the freezer doesn’t mean you should actually use it. It may be somewhat prehistoric. Cake was good despite these mishaps. However, there will be no pictures of my version. Go look at the recipe, pictures there are lovely. Despite the infrequent posts in October, I really have so much to tell you. Our little family has been very busy having fun. There has also been a sense of frenzy to our fall celebrations this year. Part of the frenzy has to do with the little arrival we anticipate in late winter – I know this is as good as I’m going to feel this pregnancy, so I’m trying to fit everything in. Jack Jr. is big enough to enjoy much of it, and since it is his last opportunity to be an “only” child, we try to make the most of it. Part of the frenzy is just the season – every falling leave and every clear blue sunny day seems to say “hurry up, winter is coming.” So we grab with both hands – playing with sticks and leaves, going to the zoo, picking apples, picking pumpkins, playing at the park, trick-or-treating. Part of the frenzy is a sense of impending change that I find difficult to talk about. This will likely be our last fall in our current home for a few years. In August of 2012, we will be moving to a new country where trick-or-treating, and apple picking, and pumpkins are probably not part of fall. Thanksgiving with family will definitely not be part of our life next year, neither will Christmas with family. It is heartbreaking and tough and horrible. That’s why my to-do list becomes increasingly frantic with every passing day as I try to squeeze in just one more American family tradition, just one more perfect memory, and just one more photo to store up for the days to come. So why do we do this when it is so agonizing? We do it because at heart we are explorers – we love learning new languages and seeing new places and meeting new people. We want our sons to grow up knowing the world is large and diverse and wonderful. We want them to learn new languages, to embrace differences, to appreciate what exactly it means to be American, to have real freedom. It has always been Captain Jack’s dream to represent his country abroad, and in this family, we believe deeply in following dreams. There will be many new things to embrace, and I’m sure we’ll take many of our own traditions with us – like other expat families. But right now, it is November. I have to plan how I’ll be roasting the perfect turkey, making all the pumpkin things my family will eat, and documenting it all for the homesick days to come. When despite the excitement, all I will want is an afternoon cooking with my mom, little boys playing at our feet.